Let’s review these common mistakes. Thinking you’re too small to be a target. Small businesses have increasingly become targets of ransomware because many have lax or non-existent security, according to Komando.com. Forgoing a disaster recovery plan. Disasters, natural or man-made, can happen to anyone. Forty percent of small businesses close after a disaster, according to the Federal Emergency Management Agency. Trying to do too much. You simply can’t be all things to all people. There’s not enough time in the day. Wearing too many hats sets your business up for failure. Ditching a website in favor of social. A social media presence is a must. But so is a search engine optimized website, which is crucial if you want to appear first when potential clients search on Google & Bing. A managed service provider, or MSP, can certainly help with the first three. 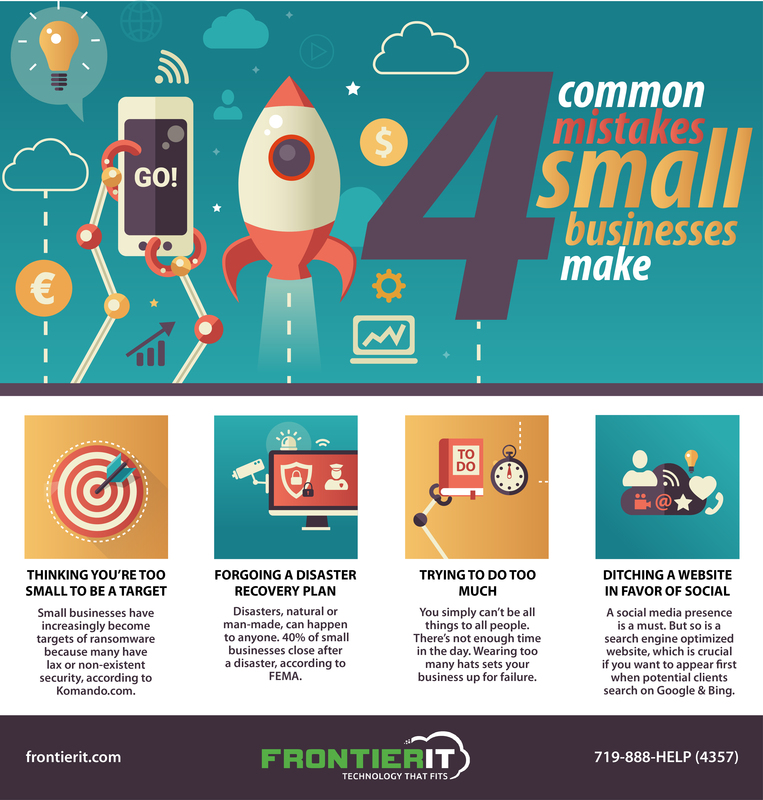 MSPs like Frontier IT offer IT consulting services, disaster recovery planning (a must for businesses of all sizes), help-desk support, server and network monitoring, and so much more. Your small business can afford a CTO. Here's how. Interested in learning how a partnership with an MSP like Frontier IT could help your business succeed? Drop us a line. We love “talking shop” with small business owners. It’s one of the highlights of our day!